NEW EXPLOSIVE DUAL LANE!!! Large Waterslide Combo. 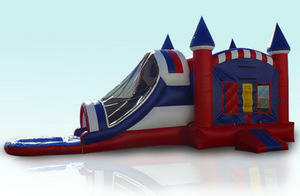 Celebrate in style with this impressive combo Bounce House / waterslide. Includes inflatable basketball goal double latters for slide large pool at the bottom with water the flows from the top as well. Included large pop-ups and Beautiful Red White and Blue colors USA proud patriotic colors.